You do not have to use a powered mix to make vegetable dip. From the family recipe archives of Stephanie Manley, you can make this yourself, at home. Recipe orignally from Bernadette, Pueblo, Co. 1977. 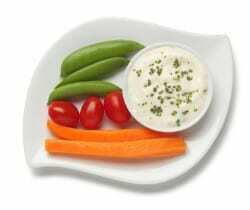 Don't buy vegetable dip when you can make it at home. Mix well and Refrigerate for 2 hours before serving. This dip was super easy to make, and it tasted wonderful!